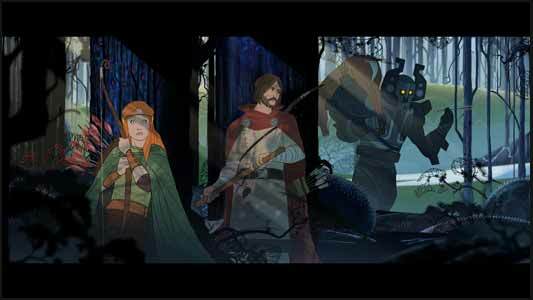 There are some games which should not work, but do and The Banner Saga is one of these as it mashes together an isometric battle system with a Telltale type narrative. 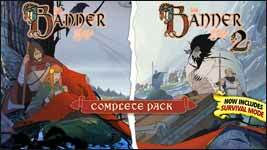 The first two games have been released as a single package for the PS4, the game was originally designed as a trilogy and as I write the developers are raising Kickstarter money to complete the saga. 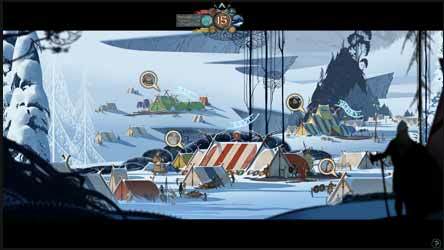 Developed by Stoic and published by Versus Evil the Banner Saga places you in the land of Norse legends. This single player game sees you in charge of various characters who, through battle, can increase their abilities for the regularly encountered fights. Each of the games has a quest narrative with your characters meeting new people and encountering new towns and villages. Your main opponents are the Dredge, an inhuman scourge who hate humanity enough to want to wipe them out. You travel a world lost to perpetual twilight, the sun having been frozen in the sky. You follow two stories each of which involves fighting the invading Dredge, eventually the two merge into one. 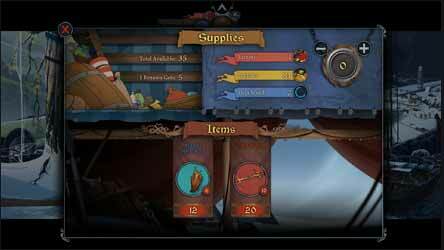 As the game offers you numerous choices along the way both parties follow differing paths to the game's conclusion. Decisions made by the player have a direct impact on the storyline, should you choose sides in a dispute? Just how trustworthy are the strangers you meet along the road. The outcome of the first game can be saved and imported into the second. Choices will determine the amount of men that you have and good choices gain you renown, bad ones will see some or all the characters killed. In all cases your choices are rarely arbitrary and will have meaningful consequences for your progress, sometimes immediately while other repercussions will meet you further down your road. 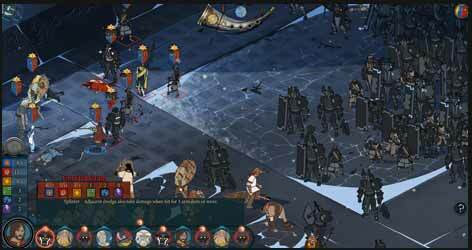 This narrative tale is often interrupted by the isometric battles, played out on a grid as a turn based strategy game. These are usually between a small number of your own men and whoever you’re facing off. Even the pitched battles supposedly involving several hundred men are represented this way. The battles offer you various pre-battle options which also affect the outcome. The game is visually pleasing as it does take inspiration from the work of Eyvind Earle who gave Disney’s Sleeping Beauty (1959) its distinctive look. The characters, backgrounds and animation sequences are all hand drawn. Overall, both games have an organic naturalistic flow to their progression, if I had a criticism it would be the numerous times you spend staring at a loading screen.